E-Couch is a web-based self-help program with modules for depression, anxiety, social anxiety, and stress-related life events (e.g., relationship breakdown, loss, and grief). 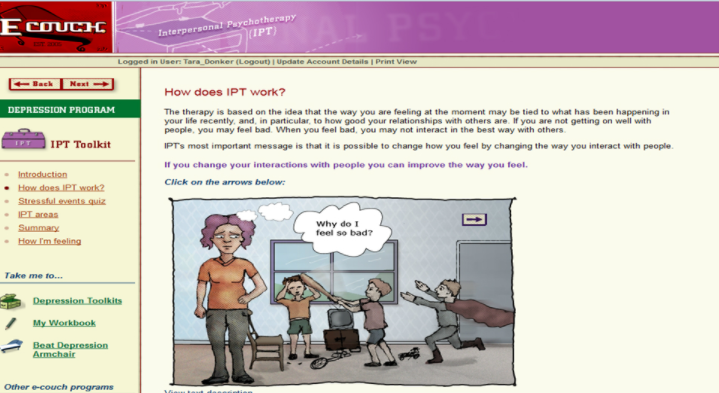 The program begins with quizzes to assess the user’s mood and emotional state. At the end of these quizzes, users receive feedback on their risk level, and based on the users’ responses, E-Couch suggests the most relevant and helpful program(s). E-Couch offers 5 programs on the following topics: depression (which includes what is depression, risks and causes, treatment, and self-help strategies to prevent and deal with depression); anxiety (which includes what is excessive worrying, how to manage worrying, and different perspectives on worrying); social anxiety (which includes what is social anxiety vs. shyness, reassessing threat predictions, strategies to decrease self-consciousness, and communication tips); how to adjust to divorce and separation; and management of grief and loss. Each program contains text modules, exercises designed to help users practice self-help strategies, and quizzes with the intention of helping users understand themselves. All available programs can be completed at the user’s own pace. Users’ completed exercises and quizzes are stored in a workbook that includes a graph displaying their results as they progress through the program. Free/ good content/initial assessment with feedback. Minimal personalization/not engaging enough/no reach-out to encourage users to make beneficial changes in their life. E-Couch is mostly suitable for adults dealing with mild issues of depression, anxiety, separation, or loss. In addition to being free to use, the program’s main advantage lies in its professional and clear content. The initial evaluations and subsequent feedback provide a sense of personalization, allowing users to get a general idea of their condition compared to others experiencing similar mental difficulties. However, beyond the initial assessment, personalizing features are minimal (mainly in open text boxes). The program is also lacking in reach-out or motivational aspects that encourage users to apply the program’s recommendations. In addition, the convenience of an online program is undermined by E-Couch’s text-based delivery method. Aiming at users dealing with mood disorders, the program’s design does not make it as easy as possible for the user to complete (e.g. by incorporating more appealing features such as animation, video, and narration). For these reasons, E-Couch can be considered a very good educational tool for those dealing with mild mental health issues. E-Couch could be helpful as an adjunct to treatment for adult patients dealing with mild mood disorders. It could be a useful informational tool and could promote patient support by helping to educate the patient’s loved ones (whether they are part of the treatment or not).